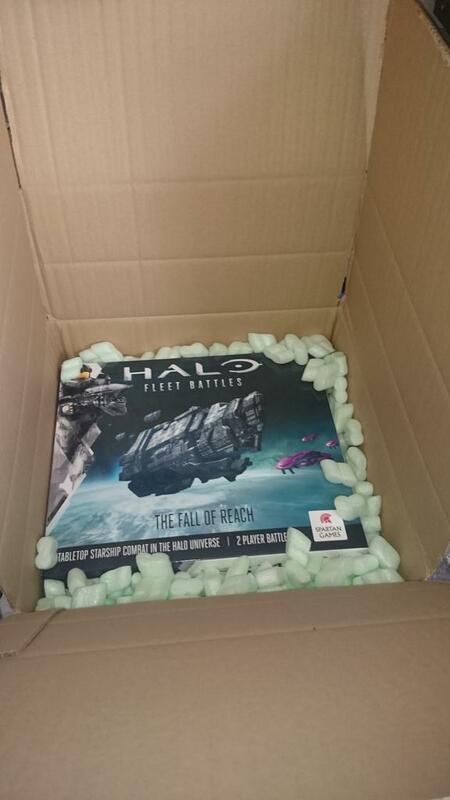 Whilst it is true that my copy of Halo Fleet Battles was delivered this morning, due to our impending holiday, it’s staying firmly shut in the box until we get back next week. 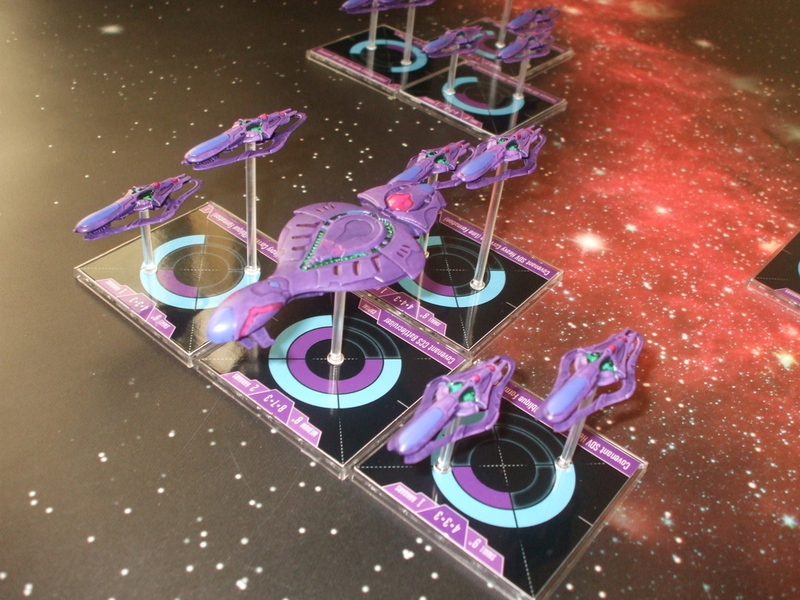 Halo – Fleet battles is as its name suggests a spaceship game based in the Halo universe and the rules have been designed to allow for large fleet actions to be played in a relatively short period of time. It uses a point’s based system to allow players to build their fleets and the basic building block is the ‘Element’, an Element is a 60mm x 60mm base which represents a unit of ships and these elements are grouped together into battlegroups. 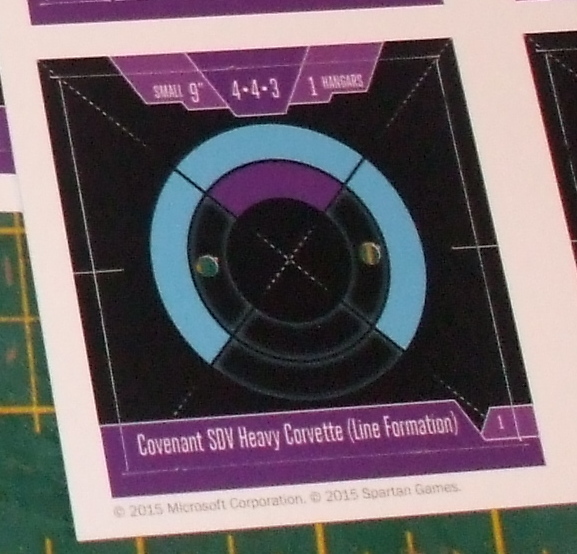 Your fleet will contain many battlegroups but to give an example in the core box the Covenant player will have enough elements to create 3 battlegroups whilst the UNSC player could create 4 or even 5 battlegroups. The game includes rules for setting up a game but generally terrain is laid out, players then decide which table edge they want to deploy on and then players alternate placing battlegroups until all battlegroups are placed on the table. Once all battlegroups are placed the players can place their ‘Wings’ on the table up to 8” in front of the battlegroups. These ‘Wings’ are small interceptors and bombers that are represented by tokens and fight their own battles during the game. Bombers can be used to inflict damage on larger ships whilst interceptors are used to try and negate that threat. Wings can also be placed on friendly element bases to represent close support and are useful if bombers or boarders break through the forward defences. Each commander in your fleet has a card which explains the orders that commander can give during a turn, these orders are represented by use of 5 special dice which are rolled during this turn and placed on the commander’s card. The orders card shows the number of each dice symbol that is required to carry out an order and also tells you when that order can be played. The wing phase is split into sections, Move and Attack with all movement being carried out before combat is worked out. Wings are represented on the table as a stack of tokens that are either interceptors or bombers (not a mix of both) and players alternate moving each wing. The stats cards give the movement value for each type of wing and movement for them is free flow with no movement restrictions. If 2 enemy wings move into contact they become locked and any wings still in contact at the end of the Wing Movement phase take part in combat. Once all movement is completed the Attack phase is started and players work through resolving the combat for each stack of locked wings. I’ll cover combat in more detail later but in short each wing token generates a number of attack dice and these are rolled to work out a number of hits. Each token can take a number of hits before it’s removed from play and wing combat is simultaneous. If wings remain in base contact at the end of the phase then they count as locked in the following turn. If a wing of bombers is able to get through to an element in a battlegroup during the movement phase and it’s not locked by interceptors then it can carry out a bombing run against the element. 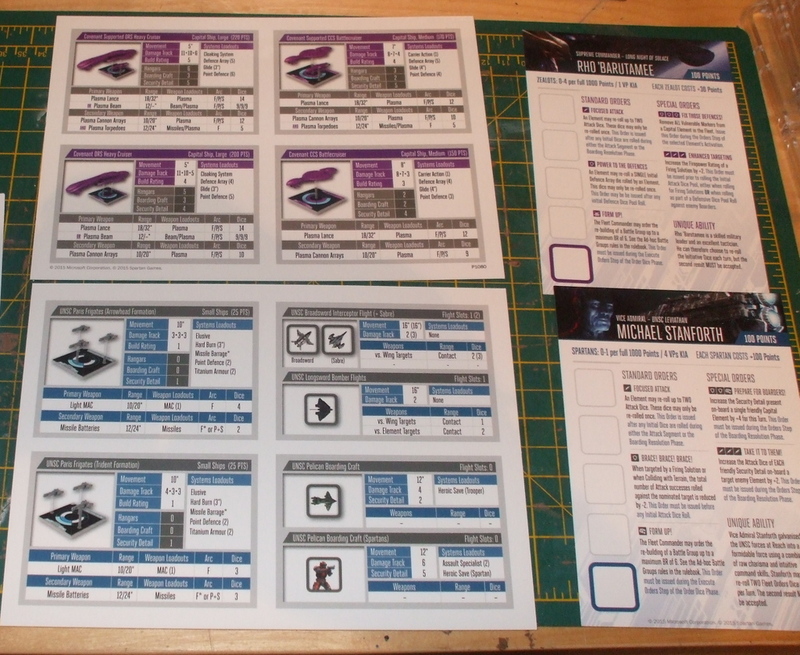 Once the Wing phase is completed its time to activate the battlegroups, player alternate and activate a battlegroup at a time, the player with initiative gets to decide who activates first. Once a player decides which battlegroup to activate the elements are moved and then combat is carried out, also during this phase boarding actions are initialised. As you would expect movement is simple with each element having a movement value, elements can turn up to 45 degrees at the beginning and/or end of the movement dependent on their type. For example an element of UNSC Paris frigates can turn at the beginning and at the end of a movement whilst a large Epoch carrier can only make a single turn at the end of its movement. There are some special rules for movement that each faction can use and in the future some commanders of heroes might allow for other special rules to be used in game. Once the elements in a battlegroup have moved, combat is carried out. Each element have primary and in some cases secondary weapons and they are fired in turn, if different elements in a battlegroup share a weapon type they can combine their fire. Before any firing is carried out players have to declare what they are firing at and with what weapons for the whole battlegroup, then you work through the firing doing all primary weapons before moving onto the secondary ones. Each weapon type has a range a firing arc and an attack value. But the actual effects of the dice are determined by the firepower rating of the shot and that’s determined by a nice little sliding scale. There are 5 different firepower ratings the higher the rating the better the effects of the shooting. For example at firepower rating 4 (which is the default) all hits count and you can reroll a dice with a Miss facing for each 2 success facing you have already rolled. The firepower rating you shoot at depends on a number of things, like the range of the shot, if any terrain is in the way etc. The defended successes are removed from the attacking successes to give you a final hit number, you then work out if you scored enough successes to cause a damage point. Each element has a damage track and this is the number of successes needed to cause a damage point, once a ship has taken 3 damage points it’s removed from the table. Other weapons like torpedoes use similar mechanics although torpedoes are vulnerable to point defence like bombers and boarding craft. Step 4 roll on the Boarding results table, each player rolls a d6 and the results are added together along with a modifier depending on what happened in step 3 and the results are applied. The results on the boarding table go from ‘Vainglorious Assault’ where the boarding action fails and all board craft are expelled into space to ‘Critical Core Breach’ where the element is removed from play and other elements around it also takes hits. Finally once all that’s done you move onto the End phase where players can try and repair damage, work out if anyone has won the game and generally tidy up ready for the next turn.